Deep bored holes are a necessity in a product such as a table lamp, where an electrical flex travels from the base to the top (see below). They are long holes, impossible to drill on a lathe, with a standard drill chuck mounted in the tailstock. A special ‘Auger’ is used to cut the full length of the hole. The tailstock centre is removed and replaced with a ‘hollow centre’. This type of centre has a hole all the way through it, which allows an auger to pass through. Grease is applied to the end of the centre, allowing the wood to rotate freely. When in use, the lathe is turned on and the auger is pushed through the tailstock and hollow centre. Cutting is usually a steady process, with the lathe operator pushing the auger into the wood and then withdrawing it from the tailstock. 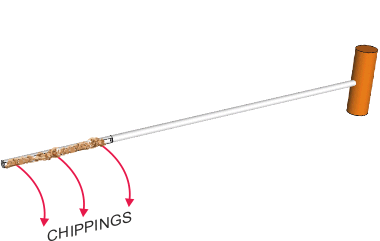 This allows chippings of wood to be removed and avoids the auger becoming jammed and consequently spinning with the rotating wood. The diagrams below have been simplified. The headstock and lathe bed are not shown. The wood is shown as semi transparent. The auger is seen being pushed through the tailstock and hollow centre, into the rotating wood. It is then withdrawn and the waste wood chippings removed. This process must be repeated, to avoid the auger jamming and consequently rotating at high speed with the wood. Auger pushed through tailstock and hollow centre, cutting into turning wood. Auger withdrawn from wood, hollow centre and tailstock. Wood chippings ‘tipped out’ of auger.